Here is a project that our Chief of Operations Zeke Lunder did for Whiskeytown National Recreation area a few years ago. The National Park Service wanted to create a display for their visitor center that showed what the vegetation had been like in the area when settlers first arrived. They provided mapping data from vegetation surveys taken in the 1950s and later, along with maps and survey observations taken by the original Federal land surveyors in the late 1800s. This data was analyzed to associate the specific types of trees observed in the first surveys with current soil and elevation maps, and the resulting data was used in a predictive modeling exercise that created mapping of potential historic vegetation patterns. 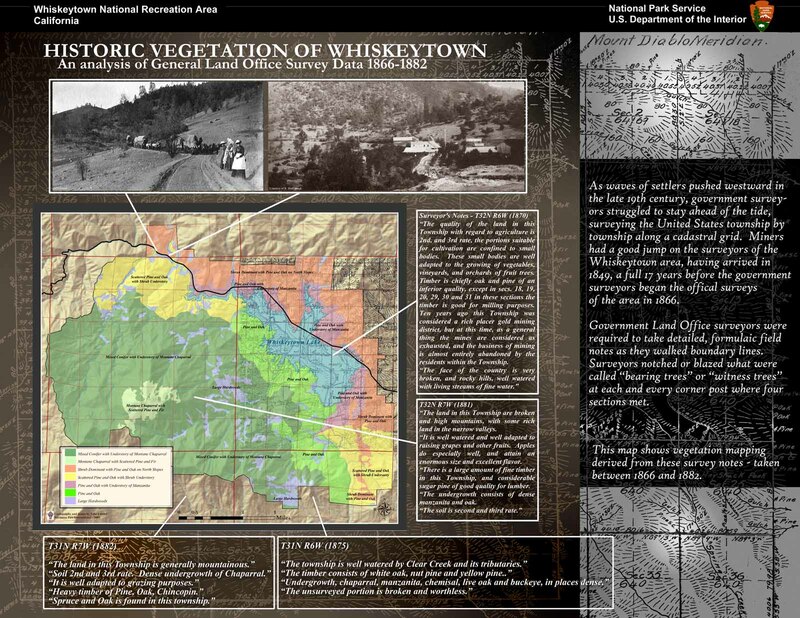 The final poster design used scans of the historic maps and photos along with modern elevation models and digital design. Research and writing to support this project by Kirsten Bovee. Here is the resulting poster display.